For a couple of years now, Apple (AAPL) and Best Buy (BBY) have been rumored to be getting more friendly. Back in 2006, there was discussion about the chance for Apple to enter into an agreements and start selling products within the Best Buy stores which never panned out. Apple had preferred to sell its products through their online and retail stores as well as by the retail channel of Compusa. For whatever reason, the Best Buy relationship never seemed to move ahead. ow things may change. 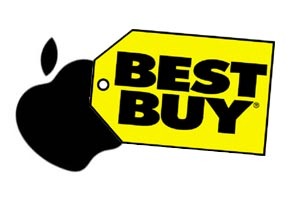 Behind the scenes, there has been some movement of late that should bring Apple and Best Buy closer together. Store employees in Florida Best Buy locations are getting ready for a a new and expanded product line. Several employees (in separate conversations) have confirmed that over 200 stores will be see specific remodeling to include Apple mini stores within the Best Buy stores at key US locations. Best Buy has begun training for the floor salespeople on the Apple product line, which is anticipated to be seen by October 2007. The design is said to be a special section within each of the initial Best Buy stores that will have a separate Apple section that will have a look and feel o the Apple brand. Specialist from Apple (Genius bars?) will have a permanent placement in each store to help with any product questions that are beyond the Best Buy employee’s range. What does this mean to each of these companies? For Apple, it has been estimated that there could be an additional $400 million in revenue realized. This is not the first time these gaits have planned on working together, each of the last times failed. This time may be different as Best Buy needs to get something going and change direction in the face of worse than expected quarterly earnings released only a few weeks ago. Apple has finally become much more mainsteam with their entire product line and now is the time for this plan. The synergy will be spectacular. The play is to go long Best Buy as they will benefit from the expanded product line which is hot hot hot. The price of shares currently in the $45 range are in need of this life preserver. Best Buy shoud recover at least to the$50 range once the revenues from macbooks, iphones, ipods and other Apple products start to roll in.